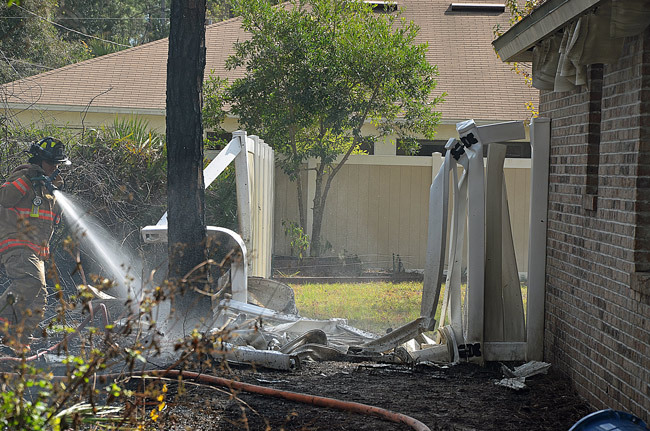 A wildfire broke out at 2:15 Monday afternoon at the southeast corner of Palm Coast’s P Section, near Royal Palm Parkway, and burned within inches of a house, melting a segment of a backyard fence and a few soffits before firefighters stopped the flames, which devoured a third of an empty lot next to the house. Fire Flight, Flagler County’s fire and rescue helicopter, was scrambled, but Palm Coast Fire Department responded fast enough to make Fire Flight-which responds to more than 100 fire-related missions a year-unnecessary. It was the closest call for a structure from a wildfire since last year’s fire season, which nevertheless extended the county’s streak of not losing a house to a wildfire over several years. A few houses have burned, but for other reasons. Monday’s fire was a reminder that dry conditions are heightening fire conditions, with little relief in sight. The drought index was at 450 Monday afternoon, on the 800-Keetch-Byram index, up three points from yesterday. The higher the index, the more fire-prone conditions are. About 22 percent of the county is over 500, with a high of 569 in one place and a low of 354 in another. The 450 figure is a countywide average, and can be deceiving. The P-Section fire took place in the lot adjacent to 6 Porpoise Lane, which parallels Royal Palms two streets in to the north. 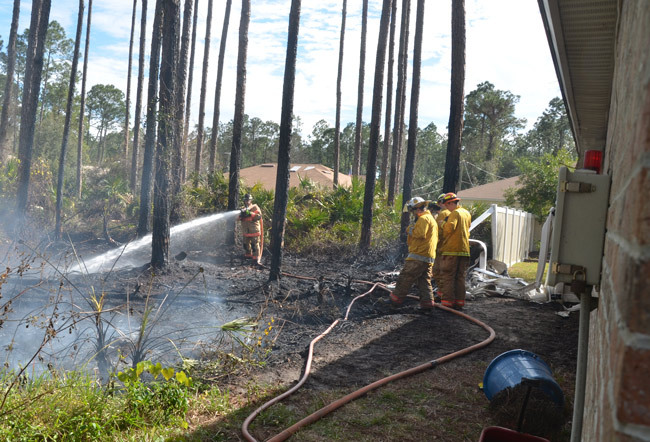 Palm Coast Fire Chief Mike Beadle happened to be first on the scene, seeing flames up some 10 feet around trees. Two people from the neighborhood were trying to put out the flames with a garden hose. It wasn’t clear how it had started. Wildfires are often started by lightning. There hasn’t been any lightning for weeks, narrowing the possibility to man-made accidents, such as coals being thrown in a lot, or unextinguished cigarette butts. There was no one in the house except for a large, boxer-like dog. “It doesn’t look like there’s anything going on in the house,” Beadle said at the scene. “We’re trying to have the cops track somebody down for us, if not we’ll break in and check it out.” Checking the house was essential, if only to ensure that no embers had manage to infiltrate the structure from any point. Moments later, a high school bus dropped off students, two of whom turned out to be residents in the house, who were able to give firefighters entry. 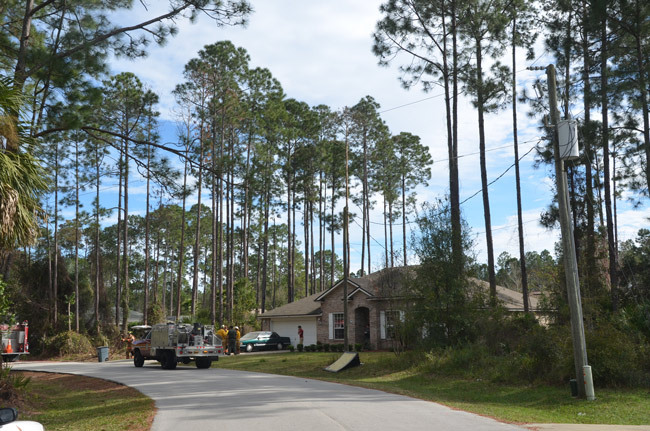 The Forest Service, Flagler County Fire Chief Don Petito said this afternoon, is predicting a normal fire season, but it’s been a warmer-than-usual winter, with pollen for almost a month and plants budding and producing more fuel, should a fire start. Petito’s advice: clear a house’s perimeter of anything that may provide fuel for a fire, clear gutters, and don’t throw burning coals out. It may sound like common sense advice, Petito said, but newcomers may not be aware that that’s a local danger. Watch for children playing with matches. Caught some in my neighborhood last year, trying to light fireworks in a heavily wooded lot during fire season. Sorry for the house owner that will get stuck with the insurance deductible…or do it yourself repair if less. With fire season upon us so early this year, makes you stop and think. I see smokers throwing out butts everyday. When was it that the beach had to be evacuated ? Isn’t that when the D.O.T. mandated that another exit was needed at Matanzas Woods ?? What ever happened to those plans. Anyone know ?? We are talking about saving lives here !!! Bless our firefighters; best in the country !! !